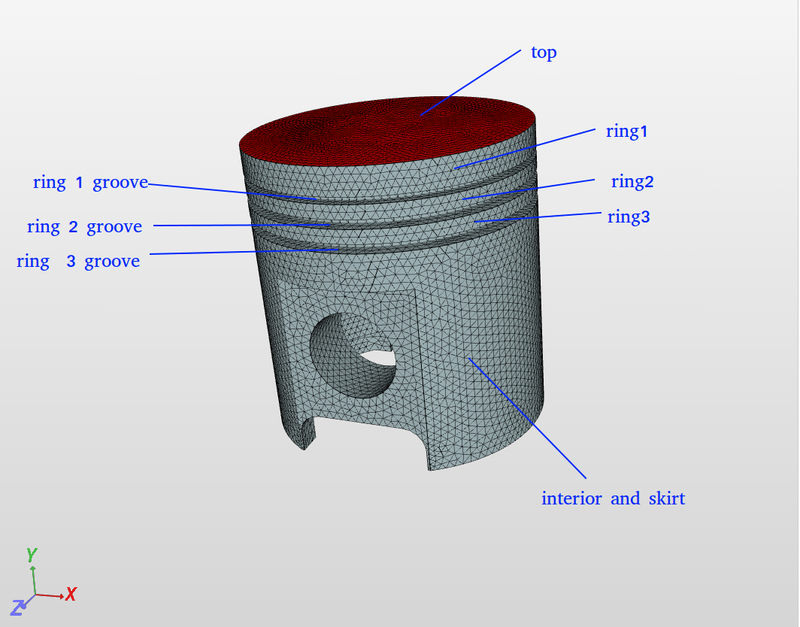 In the following you find a step-by-step instruction for a Heat transfer analysis of a engine piston. Since a lot of convective boundary conditions are applied in this tutorial, it will help you a lot to load the complete tutorial case from the SimScale project library and specify your own simulation within this project. Alternatively, you can also add the tutorial project from the ‘Public Projects’ library by searching for “Engine Piston tutorial” name. The Mesh Creator tab is the place where you upload CAD models and create meshes for them. The geometry is already available under the ‘geometry’ tree item. 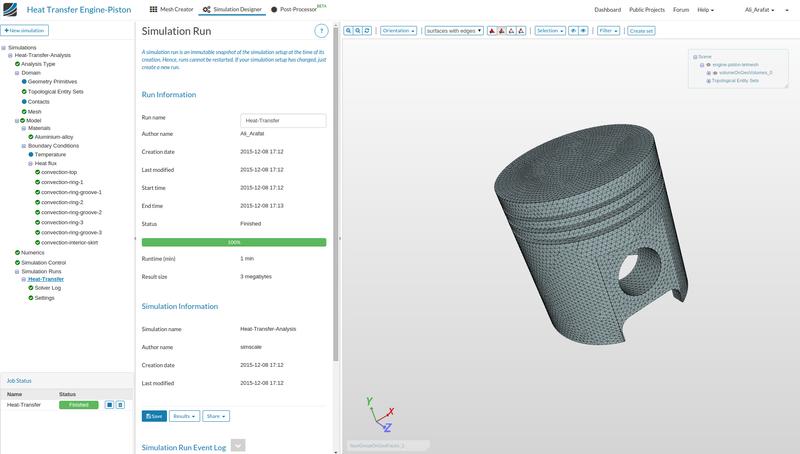 Click on the CAD model named “engine-piston” to load the CAD model in the viewer. To mesh the geometry, click on geometry in the Navigator tree and click on the blue Mesh geometry button in the settings panel. In this tutorial we choose the parameter dependent Parametrized tetrahedralization. Setup the options as shown in the figure below. After setting all parameters save your selection and start the meshing operation. Use the notifications or the job status panel on the lower left to check the status of the meshing process. As soon as the mesh is finished it is loaded into the viewer and you can interact with it in the same way as with the geometry before. Use the operations log to get some general informations about the mesh e.g. number of nodes and elements in the mesh. Switch to the Simulation Designer and add a new simulation. Setup the options for the analysis type as shown in the figure below. In the model section you can now assign a mesh to your simulation design. Choose here the previously created mesh. After you have saved your selection the mesh should be displayed in the Viewer on the right. Now we create the ‘Topological Entity Sets’ for later use in assigning bounday conditions. Click on ‘Topological Entity Sets’ under “Domain” and select the shown face and click the ‘ Create entity set from selection’ button to create a set named ‘ring-1’. The material is specified in the Materials section. You can add a new material by clicking on Add new material and assign a name to it. For a steady-state heat transfer simulation one has to determine the density (unit kg/m³) and the conductivity coefficient (unit W/mK). We assign a aluminium-alloy material and therefore choose the density to 2700 kg/m³ and the conductivity coefficient kappa to 160 W/mK. Use the Boundary conditions section in order to apply heat flux or temperature boundary conditions. A new boundary condition can be added with the Add new … boundary condition-Buttons. The piston is surrounded by convective flux from the working gas and the cooling oil. Therefore we only apply convective boundary conditions on the piston. As the heat transfer coefficient is a property of the surrounding flow the conditions have to be treated seperately for the detailed parts of the piston. Setup the Convection boundary condition for the ‘top’ as shown. Setup the rest of the convection boundary conditions based on the table above. Lastly,setup the Convection boundary condition for the ‘interior and skirt’ as shown. In the Numerics section you can choose the linear equation system solver. In this tutorial we use the direct solver Spooles that behaves well for most problems. The iterative solvers may have advantages considering memory usage and calculation time though. 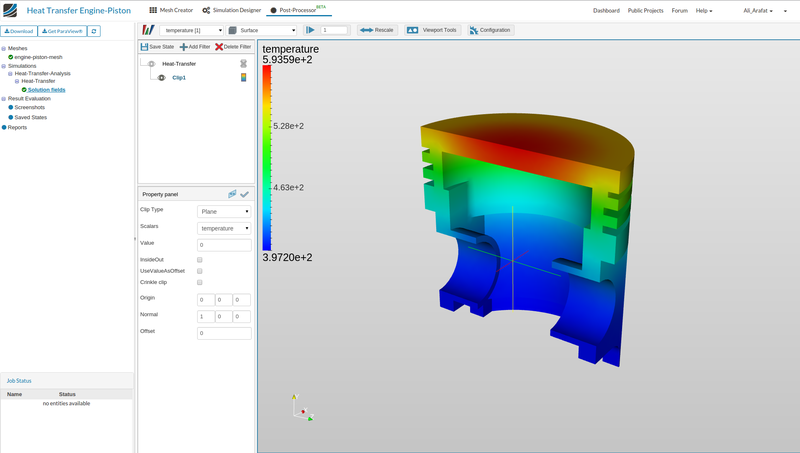 If you followed the settings of this tutorial so far especially considering the mesh fineness it is possible to select one computing core for the calculation in the Simulation Control section. For finer meshes it may be necessary to choose a larger instance in order to provide memory and reduce calculation time. At last create a simulation run that holds the current configuration of your simulation and simply start your calculation by clicking on the Start button. If you select Results you can download a zipped folder containing the vtk-files of your results and use a local postprocessor on your desktop. In order to analyse your results on the SimScale platform switch to the Post-Processor and choose your current project and run. For a Heat transfer run the results can be accessed by selecting Solution fields. Afterwards the post-processing environment is loaded in the Viewer. Goto the last result step by clicking on the arrow button. selest the heat flux field as shown. If you want to look into the piston’s interior it is helpful to define a clip filter and cut the geometry with a plane. Therefore click on Add filter to pipeline and choose Clip.